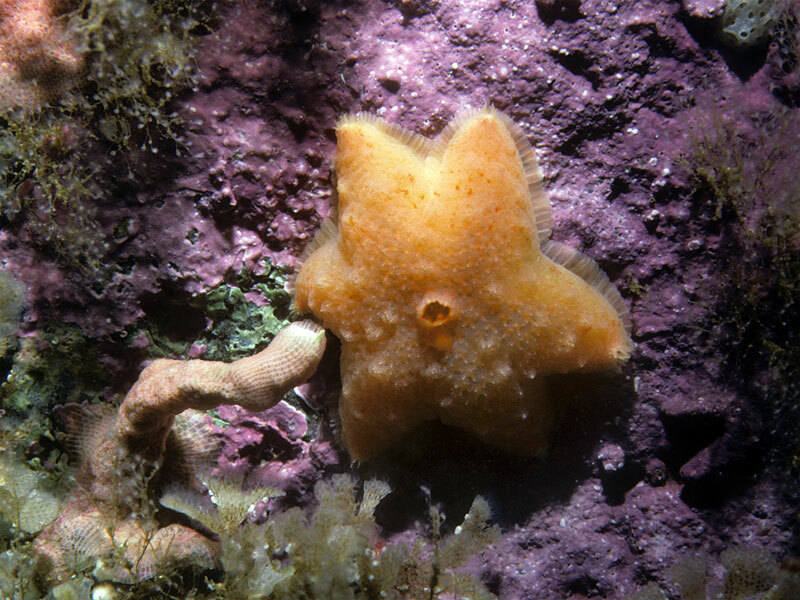 ​The wrinkled star has five (occasionally six) thick, stubby arms arms and a soft, wrinkled surface texture. A large pore is visible at the centre of its aboral (upward-facing) side. 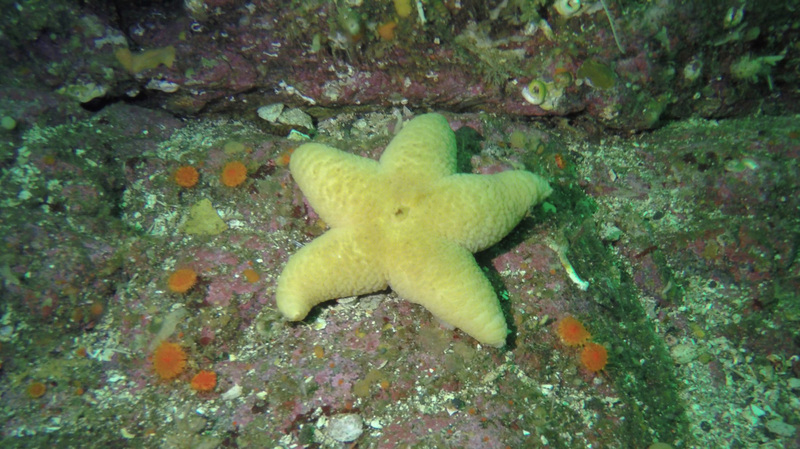 This sea star is usually fairly light in colour, from creamy white or pale yellow to light pink or orange. It grows to 15 cm across. This subtidal species inhabits rocky areas in shallower waters (10-30 m deep), but otherwise is found on muddy substrates to depths of 1,100 m. It has a circumpolar distribution: it is found on northern coastlines along both sides of the Pacific and the Atlantic Ocean. In the Pacific Northwest its range extends south to northern Oregon. The similar slime star (Pteraster tesselatus) has shorter arms and has a smoother, less wrinkled texture than the wrinkled star. ​The female broods 30-40 fertilized eggs in a chamber found underneath the skin on the aboral side; once the juveniles measure about 1 cm across they leave the brood chamber through the large central pore. Lambert, P. (2000). Pteraster militaris (O.F. Müller, 1776). In Klinkenberg, Brian. (Ed.) E-Fauna BC: Electronic Atlas of the Fauna of British Columbia. Lab for Advanced Spatial Analysis, Department of Geography, University of British Columbia, Vancouver. Accessed ​27/05/2016. McDaniel, N. (2013). WRINKLED STAR Pteraster militaris. Sea Stars of the Pacific Northwest. Accessed 27/05/2016.